Kaposi’s Sarcoma is a type of cancer that is attributed to the growth of cancerous tissue patches underneath the skin, nose, throat, and lining of the mouth. Other tissues such as fat, ligaments, tendons, bone, cartilage, fibrous tissues and blood vessels may also be involved. These patches are made up of a mixture of blood cells and cancerous cells. They are brown, red, or purple in color and sometimes look lumps or red blotches. Besides the presence of the colored, painful patches, no other symptoms will be manifested. KS may eventually develop and spread to either or both the lungs and digestive tract. This is when KS becomes life-threatening since there will be an alteration in normal breathing and internal bleeding could also occur. Kaposi’s Sarcoma is a slow developing cancer - as long as it is on its own. But the presence of other disease that make the patient immunocompromised can hasten cancer growth. The treatment of AIDS alone can aid in shrinking and limiting the spread of lesion. But when KS is involved, the patient’s health can deteriorate very quickly and even die in an instant. 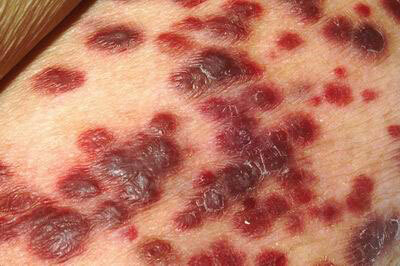 Skin lesions experienced during Kaposi’s Sarcoma can cause a lot of pain and even disfigurement. The good news is that they rarely cause physical disability. KS has several different types. All of them vary in terms of affected organs, clinical manifestations, and speed of cancer metastasis. Because of this, treatment modalities will also vary a lot. This form of KS is where there is slow lesion development. It could even last for as long as an entire decade. The pressure from the lesions will slowly increase in pressure, leading to painful swelling as a result of lymph vessel blockage. At times, lesion development may occur in the gastrointestinal tract or any other organ but are not painful at times. This form of KS was initially identified as more common within men than in women. Mediterranean and Jewish men from Eastern Europe are particularly the ones that suffer from this the most - usually the ones who are between the ages 50 and 70. The manifestations are practically the same with Classic KS. One difference is that the age bracket it affects is a whole lot younger. There are even times that African KS affects children below the age of 10. And if and when this KS will strike children, the symptoms experienced will be far more severe than when experienced by adults. Death can even occur as early as three years after it was diagnosed. But most of the time, the disease does not spread to other neighboring parts. It instead remains and does most of its damage within the layers of the skin. Like Classic KS, African KS is more prevalent among men. This is probably the unique form of KS - and also happens to be one of the most common. KS generally takes place during organ transplants almost every time. Transplant patients possess a risk of 150 to 200 times compared to other individuals. Acquired KS typically manifests itself in the form of lesions but has the ability to spread to neighboring organs and/or mucous membranes. The condition starts to materialize once a patient is prepped for organ transplant. During this process, immuncompromising medications will be administered to help prevent organ rejection. Unfortunately, the main side effect of these medications is becoming susceptible to several diseases and KS happens to be one of those. From the name itself, Epidemic KS is experienced by HIV-infected individuals. HIV stands from Human Immuno-Deficiency Virus and its name perfectly states its purpose when invading the human body. Since AIDS patients have suppressed immune systems, that makes them all the more susceptible to acquiring cancers like KS. When this disease affects HIV individuals, it has a tendency to spread quicker and may even erupt - further hastening its metastasis. This is a complete contrast to Classic KS, which spectrum of creating damage is very limited. Common body parts wherein Epidemic KS occurs are the lymph nodes, spleen, liver, lungs (where it is most deadly), and gastrointestinal tract. Though surgery is effective in visually exploring the system and manually remove the cancerous tissue, it does not necessarily remove them all at once. There is also the risk of surgical complications from taking place. Chemotherapy and Radiation therapy have essentially the same function and that is to kill all cancerous cells. But the problem is both do not have the ability to recognize cancerous from healthy cells. As a result, otherwise healthy cells are also killed during therapy. An example of healthy cells it kills are hair cells. This explains why most cancer patients look like Mr. Clean. Biological Therapy is relatively new to the medical world. This is why not many doctors use it since sticking to traditional methods is something usually put into practice. Due to the facts stated above, each treatment option definitely cannot stand on its own. At least two of them are being used hand in hand since they are all best used as complementary methods to each other.